Fluid has spilled the beans about its new FPX7 range. NAMM 2015: Fluid Audio has announced the FPX7 line of monitors, which it says are the first to feature a ribbon coax tweeter. Promising a "truer, more accurate monitoring experience," the first pair in the range is the FPX7 DSP, while an enhanced version, the FPX7 DSP+, also coming. Check out the press release below or the Fluid Audio website for more details. The FPX range will be available in March - prices are $700/€649 for the FPX7 DSP and $1000/€960/£760 for the FPX7 DSP+. 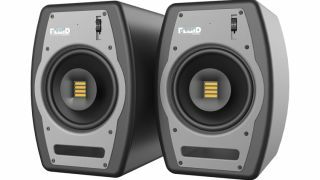 Building upon the acclaimed and well received Fader Series studio monitors, Fluid Audio now announces the FPX (Fader Pro Coax) line of studio monitors, with the new FPX7 leading the way. Featuring optimized Class AB amplifiers, shorting ring magnet woofers and ribbon tweeters, the FPX7 offers a truer, more accurate monitoring experience. The FPX Series will include two models: FPX7 DSP, and a more feature rich version to come later. Both with a 7" inch woofer and AMT Ribbon tweeter. "Ribbon tweeters have certainly been used in studio monitors before. It's a perfect use for them, actually. However, I've never been that impressed by previous executions of the idea. I've always felt I could do a ribbon monitor that sort of set the standard for ribbon monitors, and I believe this coax idea does that. You get the lightning fast response of the ribbon, and the point-source goodness of being coaxial." Says Kevin Zuccaro, the ears behind the Fluid Audio brand and its owner. "As a recording musician myself, I was always a little frustrated with the way a lot monitors would "Hi-Fi-ize" my live recordings. I would record something live in a room, but played back through the monitors, it already sounded kind of slow and dull. With our new AMT ribbon tweeter, you get that immediate, live sound that you recorded. That, coupled with the low distortion woofer and great off axis response of the FPX7, you have a clear, honest view into your mixes. "—said Kevin Zuccaro. The FPX Series will be available this March with the following respective street prices, FPX7 DSP ($699.99 USD/€649), FPX7 DSP+ ($999.99 USD/ €959.99/ £759.99).